World leaders meet in New York this week to try to break the political deadlock on climate change and gain momentum leading up to the Paris climate negotiations in 2015. As it stands, climate policies are not going to be sufficient to keep global warming to less than two degrees above the start of the industrial revolution, a target agreed by world leaders. What our research published this week reveals is a new dynamic – namely the speed and extent to which China’s economic development has reconfigured the global distribution of emissions. China now emits almost one third (30%) of global carbon-dioxide emissions. This is more than the US and European Union combined. In 2013, China emitted more carbon dioxide per capita than Europe, and has per-capita emissions 45% above the world average. Globally, carbon-dioxide emissions from fossil-fuel combustion and cement production grew 2.3% in 2013 and are set to grow another 2.5% in 2014. Global emissions are set to top 40 billion tonnes of carbon dioxide in 2014, including from deforestation. Despite climate negotiations over the last 25 years, emissions are set to be 65% above the levels in 1990. Chinese emissions accounted for over 50% of the increase in global emissions in 2013, or over 60% for the last decade. No matter how the data is presented, China is now pivotal for keeping temperature below two degrees. Even with China’s immense investments in renewable technologies, its ambitious emission-trading system, and strategy to deal with air pollution, the harsh reality is emissions are rising and they must peak and fall soon to improve the chances of remaining below two degrees. 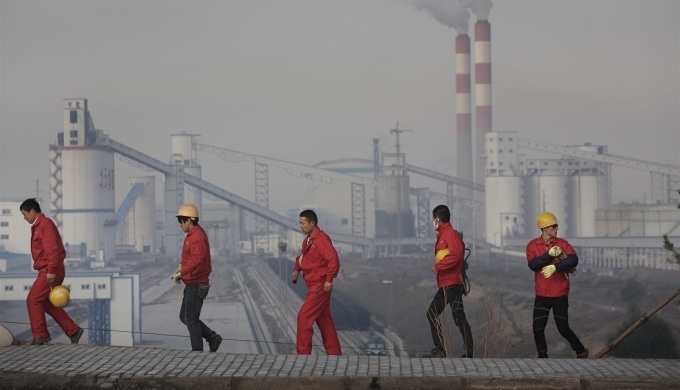 Coal still dominates, with Chinese emissions growing at 4.2% in 2013. While the 2013 emission growth is lower than the decadal average of 7.1% per year, this is in a large part due to decreased economic activity. If economic growth returns to higher levels, then the effect of Chinese climate policies can be fully evaluated. Our carbon budget data clearly shows that China’s position in carbon geopolitics has shifted. Decisive action from China would send a strong signal that the two-degree target is achievable, and give developed and developing countries alike, no excuses for further delay. Glen Peters is senior research fellow at the Centre for International Climate and Environmental Research (CICERO), Oslo, Norway and author on the 2014 Global Carbon Budget. The article was first published on China Dialogue.